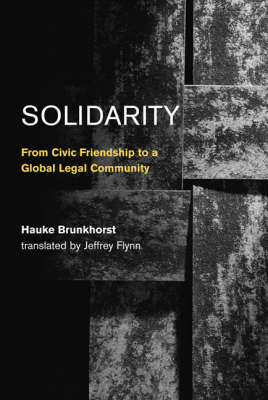 In Solidarity, Hauke Brunkhorst brings a powerful combination of theoretical perspectives to bear on the concept of "democratic solidarity," the bond among free and equal citizens. Drawing on the disciplines of history, political philosophy, and political sociology, Brunkhorst traces the historical development of the idea of universal, egalitarian citizenship and analyzes the prospects for democratic solidarity at the international level, within a global community under law. His historical account of the concept outlines its development out of, and its departure from, the less egalitarian notions of civic friendship in the Greco-Roman world and brotherliness in the Judeo-Christian tradition. He then analyzes the modernization of Western societies and the destruction of the older, hierarchical solidarities. The problems of exclusion that subsequently arose -- which stemmed from growing individualization in society (the "de-socialization of the individual") as well as from the exclusion of certain groups from the benefits of society -- could be solved only with democratic solidarity in the form of its "institutional embodiment," the democratic constitution. Finally, Brunkhorst examines the return of these exclusion problems as a result of economic globalization. Analyzing the possibilities for democratic self-governance at a global level, Brunkhorst finds in recent global protest movements the beginnings of a transnational civic solidarity. Brunkhorst's normative and sociological account, mediating between these two perspectives, demonstrates the necessity of keeping normative requirements systematically attuned with conditions of social reality.